Most of wineries have already developed their strategic plans for 2018 and are starting to execute. The plans had to be put together using history as a guide, laced with a hint of a best guess. That's just the way this family owned industry has to roll. What would you say if I told you that growth in sales for 2017 which looked pretty good through mid-year ... hovering around 7%-9%, fell off the cliff in Q3 and came in for 9 months at 0.30%? That is zero-point-three-percent year to date for our benchmarks of Family Owned Wineries using financial statements. We'll be lucky to hit 4% growth for the year when factoring in what normally is a good October/November/December. 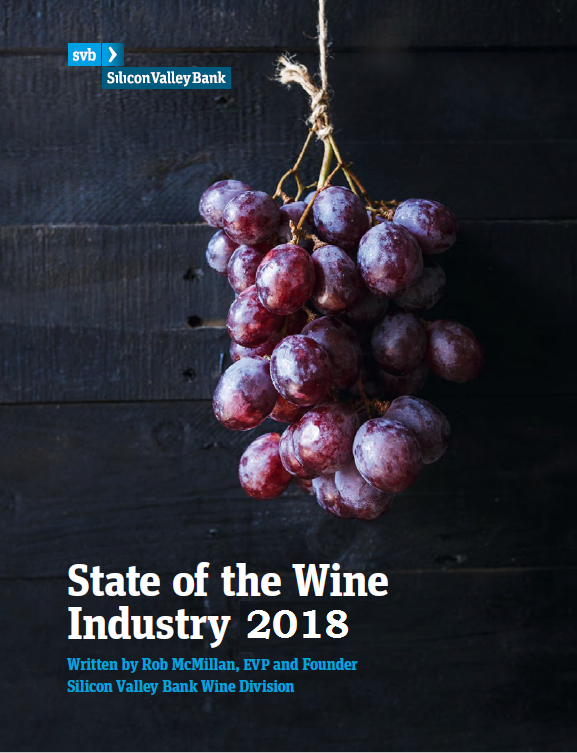 You might be saying, well that's just the average sized family winery, which is true - but the sales growth rate for larger wineries in distribution has also been dropping since the end of 2015. What if I added that visitation to tasting rooms has been going through a decline for the past 5 years? Don't you want to know what's happening? The industry is pivoting and I can tell you for certain that winery owners need to take specific actions or be caught behind the change curve. But I also believe 2018 will be a pretty good year for the industry as a whole despite these disturbing sales trends. 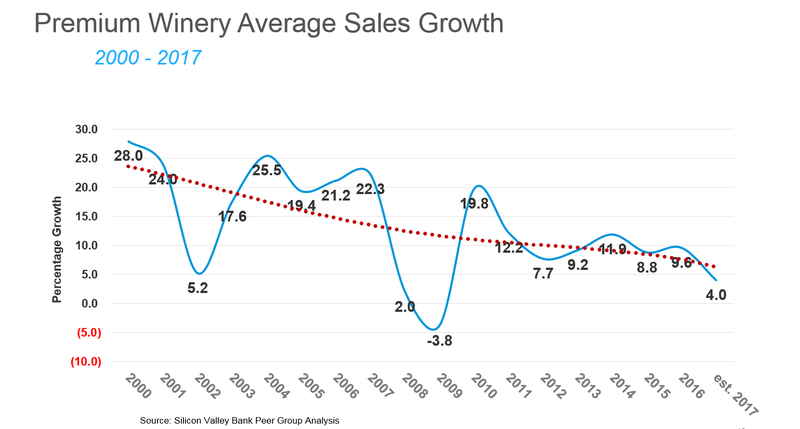 What's happening with winery visitation growth? What's happening with industry sales growth? When will millennials come to the rescue? Can wineries increase prices in 2018? Are we entering a vineyard real estate bubble? Will grape prices continue to rise? Can luxury brands increase price? How much can fine wine sales increase next year? What varietals are selling and who is buying? What role might bottled imports play? Which price points are moving or stalled? I started researching in late October, began writing the Annual Wine Report in middle November, augmented my findings in early December and completed writing by December 18th. I think I have a pretty good guess what the year ahead will be like and I want to share it with you! It's going to be a great show but if you can't make the live videocast, please [register] to receive a link to the video replay and the complete 2018 Wine Report after the event. Thats a good standard set of questions.... Over the last 10 years the answers have been relatively easy to ascertain. It seems to me we are entering a new phase with many changing dynamics. As a grower in 3 counties I do not see the rise and fall cycle in grape pricing that we used to see. Cost to produce is the age old problem and continues to outpace price paid for fruit. Something has to give. Either grape prices rise or we see more consolidation and or bankrupt vineyards. Paul- Thanks for the comment and logging in with your real name. While I appreciate all comments, I really appreciate when people use their names instead of "Anonymous." I agree with your comment on grape pricing cycles. Decades ago, there was less separation between regions in bottle price and grape price. The two are linked. In lean years and in years years of plenty, it was normal to see wineries in a given region bring in juice from other counties when they were short, and for large wineries to buy up the excess at cheap prices when harvest was long. Price would grow and shrink along with the inhaling and exhaling in grape demand. Enter decades of bottle price escalation in premium regions and factor in the emergence of worldwide bulk deliveries into the lower price segments, and bottled imports into the premium segments - and the cycle falls apart. It's not gone - just less volatile. Regarding the profitability of vineyard production, it really depends on the counties in which you operate. It's difficult to make a buck in the Southern San Joaquin for many reasons I've spoken of in the past, but growers are making good returns on the North Coast in their operations, as well as in the Pacific North West and in most of the Central Coast. There's no question that vineyard owners see enhanced ROI when they sell the vineyards typically. That's when they really see the return for appreciated assets. Otherwise - just like residential rentals, you might not see great returns during a hold period. But add a little debt to the asset and factor in the terminal value of the asset, and vineyard ownership can be appealing as long as there is demand for the grapes. Today the factors impacting grape pricing are varied, but at the soul is consumer demand. If demand is dropping as is the case in lower price point production, it's hard to get premium pricing until enough vines are pulled to match fruit demand. The North Coast will face a similar problem with premium consumers looking for value in the future. That doesn't mean removals in that case, but it does mean grape pricing and linked land pricing is about to take a pause in the growth experienced over the past 5 years. I don't foresee bankruptcies because there is demand for the limited arable land that's available for premium production, but we will see land continuing to trade for the near term and that could be called consolidation. That trend of growth and flattening in land/grape price is something that's happened there for 50 years and in a little prelude to the report release, that is what I expect to see happen in 2018. Our latest data (12/2017) suggest restaurant wine sales are down-especially among those 35+. We also see spirits gaining at the expense of wine in 2017. As for DTC, our new Wine Clubs Dynamics report goes into considerable detail, but we are seeing a decrease in winery visitations-especially among the more casual visitor segment. Eagerly anticipate your presentation next week. Pat - thanks for the comments. Always appreciate your insight added to the discussion. As to the tourism dimension of the industry (as a tour guide/transportation provider), I'm curious about winery visitation trends. Napa seems to continue to show absolute numerical growth, but maybe rate of increase slowing or flat-lining. Tasting fees are commonly $35 to $45 per person, and many now at $65 to $80. A lot less in Sonoma. Bill - thanks for the comments. Tourism is up in both Napa and Sonoma Valleys. Average room rates and occupancy rates are increasing, even while adding rooms. Average Napa Tasting Fees are $38/$66 for standard/reserve while Sonoma is $21/$39. It's a paradox as to how you can have higher tourism to wine country, and lower winery visitation, but I think I have the handle and we'll cover that next week ... at least it's a talking point I hope we get to! A question I have about the above chart, is doesn’t differentiate between wholesale sales growth and DtC growth? As laws change, allowing more DtC shipping, I see wineries spending far more energy growing their relationships with members to grow their most profitable sales channel…DtC. Also, as suggested above, tasting fees have increased so tasting rooms and wineries may be seeing less overall traffic, but higher conversions and greater growth in the LTV of their clients. 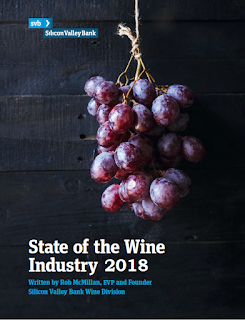 Even with a decline in TR traffic, if wineries are finding new or competitive ways to sell more to their mailing list, club and allocation members, Overall sales dollars/volume could be down but profits could be up. Matt - thanks for the thoughts! DtC has been rescuing wineries and now is responsible for about 60% of the average winery's revenue. A misconception around direct sales is that they are more profitable. In your comment you say it's "their most profitable sales channel." The reality is on a pretax profit basis, direct and wholesale revenue produce about the same profit. While it's true that wineries can get more revenue per case by going direct, which means a better gross margin, when you allocate the other costs of direct sales such as tasting room and employee salaries and benefits to the equation, the net profit isn't much different between the two channels. What should be noted here is DtC has dramatically increased in the past 5 years as a percent of sales. That's higher revenue per bottle on the top line. But despite that higher revenue, over sales growth has declined. Rob, I think you're generally right that while the revenue is usually 2X or more DTC through tasting rooms, the profits are actually pretty similar. But that's because tasting rooms don't really scale to the level they need to to make up for the fixed overhead with running them. However when it comes to DTC sales online (no tasting room), they do. The gross and contribution profit $ are significantly more per case, even if the contribution profit % is similar to wholesale. If volume starts to scale significantly (100K+ cases DTC) and a winery can leverage economies of scale on shipping and fulfillment, even contribution profit % will also start to outpace wholesale quite significantly. If tasting rooms are looked at as the entry point to building that initial DTC relationship and it's assumed that the relationship then moves to an online relationship (outside of an occasional tasting room visit) then the tasting rooms start to look quite a bit like retail and restaurants in the fact that they give consumers the opportunity to discover and connect with the product in the physical world, but the experience is obviously much more controlled for the most part (story, pricing, positioning etc.) and providess a better and more memorable overall experience leading to better loyalty. The economic comparison of tasting room vs wholesale isn't surprising since [(tasting room staff salary/benefits/commission + keeping the lights on) = (distributor profits/DA/Commissions + retailer margin/billbacks)] . In our business which is now 80%+ DTC (online) as far as $; and 66%+ as far as volume, the Rev and gross profit $ per case in DTC is 2-2.5 what the are in wholesale. The contribution $ per case are approximately 1.5-2X what they are in wholesale even though the % is very similar. Looked at another way, this means we clear 2-2.5X the $ revenue and gross profit, and 1.5-2X the contribution margin $ for carrying the same COG on that case. At scale, it can be a powerful thing for a business to be able to make 2X+ the revenue on the same cost of inventory and control reinvesting that money into their customers and infrastructure vs. the traditional system. So perhaps a better way to classify the channels is "Traditional" (wholesale + tasting rooms) vs. "Emerging" (online, party planning) or maybe "Old world" vs "New world" :-). Thank you for publishing the Annual Review. The insights are invaluable, and it is always a fun read. I also appreciate the time you take to reply to the comments. I work exclusively with wineries making less than 10k cases per year. According to Wine & Vines, close to 85% of all wineries fall in this group, so I refer to these wineries as being part of “the other wine industry” because their results are often counter to those of the larger wineries. Regarding the profitability of the DtC channel, yes there are more direct expenses to run a tasting room and club program, but the net profit is still greater for these wineries than if they had sold the same amount of wine in the distribution channel. A second factor affecting the small wineries is that their winemaking costs are high due to small production inefficiencies. Therefore the gross profit in the distribution channel is so small, there is almost no contribution to the overhead costs. However, a 3,000 case winery selling only in the DtC channel can make a significant profit. And they are cash positive, which is probably why they fall under your radar. I have only one client who makes a profit in the distribution channel. This is possible because he is a shrewd buyer of grapes, keeps his production costs low, and knows exactly what style of wine his customers will buy. Looking forward to this year’s report. 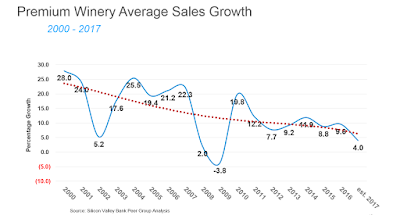 Your headline about “the disturbing sales growth trend” matches what I have seen for the tasting rooms, but not for the wine clubs. The wineries with well run clubs continue to see growth in that channel. Jeannette- Thanks for logging in and the comments. Our average client winery is about 15k cases and we bank about 375 wineries on the west coasta. Thanks for all your great research and reporting in the wine and vineyard industries. We're all anxious to see the Q4 sales numbers and the 2017 Crush Report. With the Dow closing above 26,000 for the first time and up 31% in the last year, I'll bet Q4 wine sales were pretty good, particularly in the ultra-premium segment as people celebrated their healthy year end bonuses. BUT this aging bull market is 9 years old and won't last forever, so it seems time to really focus on the quality/value ratio of our products, salt away some profits to strengthen our balance sheets and prepare for the inevitable downturn. Just my $.02. Looking forward to lots of good data coming out of Unified next week. Thanks for the comments Peter. See you at Unified!